In Chapter 4 of Joel Salatin's book"The Marvelous Pigness of Pigs' he provides some powerful Biblical perspective on why eating animals is o.k. in light of the Christian's desire to honor animals and treat them with reverence. I meant to post this a couple of months ago and it sat in draft form! I'm basically just posting this section verbatim. Please enjoy. "Perhaps a big issue we need to deal with at this point is the push back that if life is so special what gives us the right to kill and eat? How does killing the pig honor it's glory? How is the "pigness of the pig" reverenced when we enjoy bacon for breakfast? That's certainly a valid question. First let's look at this Biblically. Nowhere does the Bible even hint that eating animals is wrong. The Patriarchs ate animals. The Prophets ate animals. The kings and peasants all ate animals. The feasts included animals. Jesus ate animals. The disciples and apostles ate animals. How does killing and eating animals add strength to their glory? Because life requires death. While it's true that killing a carrot in the big scheme of things is no different from killing a chicken; when the blood flows and the eyes go dim it's far more graphic and real. The typology of sacrifice preceding life occurs throughout the old testament and culminates of course in the ultimate sacrifice of God's son as the perfect lamb to take away the sins of the world. Every time we kill something whether seed embryo (wheat) vegetable or animal in order to live, it should remind us not only of the sacrificial death of Jesus that enables us to partake of eternal life but also how precious life is. Life is so precious that it requires death. The goal of radical animal rightists working through research scientists to grow non-living meat like substances from human feces or primal slime in petri dishes is a denial of this foundational principle that life requires death. Jesus uses the principle of seed being planted and dying before sending forth the new shoot. Unless it dies the new shoot can't come forth. Everything, everything, everything requires death in order to create life. And lest anyone think I'm skipping the Edenic period when nothing died -we're not in Eden anymore Toto! We don't have perfect bodies. We live in a fallen world in which bringing glory to God includes appreciating the cost of life in him. It is precious enough to require death. Eating reminds us of that with every chomp of our jaws. Our sustenance is completely and utterly dependent on taking life; be it plant or animal. That alone should drive us to appreciate the sanctity and precious value of life. That means we don't hurt people and things unnecessarily. We are all one step away from our last breath. Every breath is a gift borrowed or snatched from the hands of death. ...I would suggest that what makes the sacrifice of any being sacred is how it was honored in life. To take that one step further, I would even suggest that only when we've honored the life do we have the right to make the sacrifice. In other words someone who has abused the life, disrespected the life, looked at it as just inanimate stuff does not deserve to kill and eat. The right to participate in that sacred act must be earned. Think about the worship surrounding Biblical sacrifices. Every one entailed a hush -a God-centric demeanor. Sacrifices were not a place to exalt the dominion of man but a place to humbly appreciate the cost of life. And of course alter sacrifices show the cost of forgiveness which is the door into eternal life. Viewing life as mechanical like industrial farming does cheapens it, which in turn cheapens the death. Is it any wonder that our culture is wrestling with increased violence among humans when we cheapen life through CAFO's and a cheap food policy -which is actually a cheap life policy. Food is life. Food must live in order to die. families who spend extra on high quality food, who emphasize sacrificial value in food create a beautiful platform for explaining the cost of salvation. If our food goal is the cheapest stuff available, what does that say about the cost of physical life? By extension what does it say about the cost of eternal life. Please don't construe my meaning beyond it's intent. I'm not suggesting that we be careless about shopping and comparing prices but price is definitely not the number 1 criterion. Glory. Does this food honor life's distinctiveness is the number 1 criteria. After that's been met, then be frugal! Anyone who has hung out with me since this last summer knows that I’ve been eating very little fast food. I wouldn't say I was eating a ton of fast food before -in fact, I began to actively reduce my intake a few years ago in an effort to facilitate better blood health. But reading a book by Joel Salatin titled “The Marvelous Pigness of Pigs” has made a veritable impact on me and our family. I’ve always loved fast food; I used to work at McDonalds and I’ve been a notorious advocate* for Taco Bell. In fact, even recently I would dream and scheme about how cool it would be to run a fast food restaurant! I used to scoff at people who got over emotional about how “nasty” or un-healthy fast food was. In my heart I felt they were mostly driven by a desire to appear sophisticated and set themselves apart from the masses or else they were weak minded people who got worked over by the “Super Size Me” documentary. I would often challenge people to be less picky and be open to more fast food if only for the sake of table fellowship. Suffice it to say, i was never looking for an excuse to stop eating fast food! And, while we haven’t completely stopped eating it, I now try to avoid it for the most part. I’m thinking very differently about the fast food industry, farming, food production and nutrition. And my change in thinking on these things is being facilitated mostly by theological discussion on God’s design for creation and for our bodies and even for human work. Joel is a passionate educator who mostly helps people learn how to farm in ways that are sustainable, healthy and ecologically beneficial. Even though most of what he promotes seems like old fashioned common sense he’s often considered a “radical” and a revolutionary. He is certainly creative and innovative. Joel takes a lot of heat because he’s an outspoken critic of industrial farming practices and food systems driven by greed and sustained by exploitation. But I think Joel is helpful because he labors to farm in ways that are fundamentally glorifying to God. He makes a point not to divorce his theology and his understanding of God from his farm work and business practice. Again, that sounds like simple Christian integrity, but when you step back and realize how un-thoughtful we can be about God’s design and how He would have us interact with animals, produce food and take care of people, you can see that most of us are carelessly hypocritical and un-Biblical! One of Joel’s newest books is titled “The Marvelous Pigness of Pigs.” Most of what he writes (I think) are practical “how to” books about how to farm under girded by theology and the Christian worldview. But this book is a theological treatise with farming and food production in view. It’s a challenge written specifically to American Christians addressing Creation care and stewardship of the earth. In my next post, I’ll share with you one of my favorite parts of Joel’s book. For now, I just wanted to tell you how much I’ve been impacted and recommend it to you! Often times when talking about the way that Cru staff like us go about raising their funds -whether we are talking to student leaders, people at church or even some of those who actually support our ministry, people will say something like: “It seems really awkward to ask people for money.” Implicit is a sort of “I’m glad I don’t have to do that” and sometimes there is a general “You shouldn’t do that either.” sort of vibe. In response, we can talk about the Biblical precedent for missionary fundraising or cast vision for the amazing way that “ministry partner development” enables more people to actively engage in Great Commission work. We can rightfully highlight the way that the work of fundraising builds faith and even galvanizes conviction in the heart of the missionary. We can explain that what people give is ultimately an offering to God -it’s supposed to engender true worship and God-dependency. But with all that, I have no qualms admitting: It is awkward! It’s awkward -uncomfortable, odd, sometimes even humiliating to initiate a conversation with someone and ask them to give money. But when you get down to it, most of our job is awkward. Raising funds to work on campus is just the beginning! After we get done with that we spend time sitting down with random strangers in dining halls; we strike up a conversation and trust God to help us talk about spiritual things. (In Asia, we didn’t even have the necessary meal card so for every meal we had to ask a stranger to swipe their ID just to get us some food so that we could then sit down at the tables and make new friends.) We set up tables in high traffic locations and invite students to fill out spiritual interest surveys or interact with deep spiritual topics. During the afternoons and evenings we sit in rooms and open the Bible prompting people to talk about their shortcomings, weaknesses, sins and need for God -in short, we host awkward conversations. We plant ourselves in residence halls -believe me, as I get older, this is only getting more awkward! We hang out in fraternity houses. We set up tents and signs, we send emails and facebook messages where we identify ourselves with Christ and ask people to interact about God. We do awkward things. One of the main reasons I believe in Cru’s ministry partner development model is that it prepares people for the awkwardness of ministry. A person willing to endure the awkwardness of support raising will probably be ok stepping out on campus. Doing evangelism in our culture is awkward. Asking somebody who is having a hard time if you can pray for them can be awkward. And yes, raising funds the way that we do is awkward; it's not only awkward, but that's part of it. As we proceed in ministry I can only ask that Jesus give us the courage and humility to press into the awkward space. In the sermon, Piper spends a lot of time talking about spiritual battle and unpacks scripture to explain that “life is war”. One famous punchline in the talk is this: “Until you believe that life is war, you cannot know what prayer is for.” He contends that without a “wartime” mentality we will ultimately overlook the vital importance of prayer and miss out on all that God has for us in it and through it. Piper compares prayer to a “wartime walkie talkie”. In the midst of our spiritual battle, it’s a life altering, gospel advancing means of communication with our heavenly father. When we fail to recognize that life is war, we inevitably don’t pray, or we use prayer as though it were a “domestic intercom” system that we might use in a house to call for more pillows in the den. We end up self-centered and misdirected, there’s no intensity, and it lacks power in our lives. 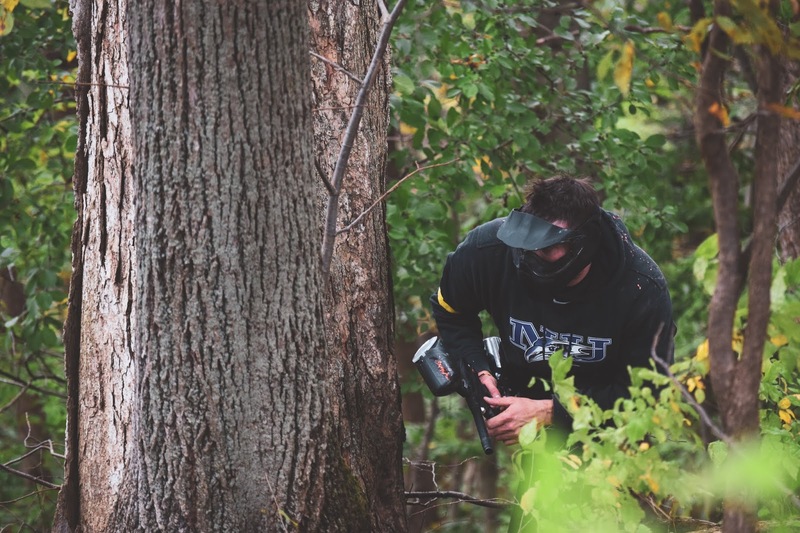 At our Ironman Men’s time we play paintball on a course we set up about 8 years ago. When we host paintball events we try and not only facilitate a really fun time, but also make it as purposeful as we can by having a short ‘debrief’ at the end. We have the students play different games and in the end we gather up around some food and have a discussion. (We use basic experiential process learning skills.) The discussions are not sermonic, but they are places where we can introduce spiritual concepts, interact about worldview and hopefully help people to understand the glory of life in Christ more adequately. This year, in order to talk more about prayer and the spiritual ‘wartime mentality’ we invented a paintball game we called “Wartime Walkie Talkie.” Through victory in another competition, one of the teams was given an actual walkie-talkie. 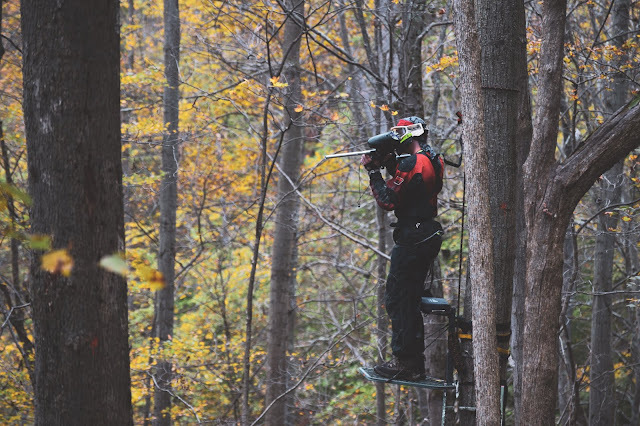 Then we placed our intern Scott up in tree in a deer stand right in the middle of our paintball course. 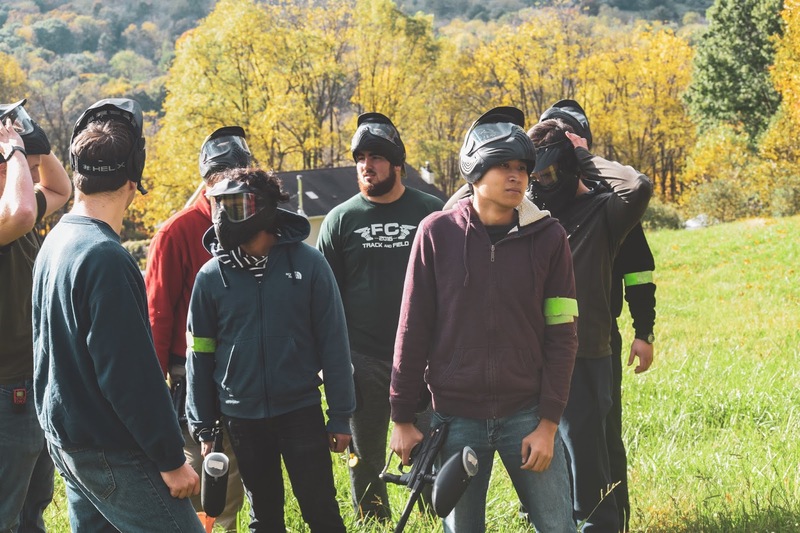 Scott is a very good paintball player because he played on the Cornell club team. Scott also had a walkie talkie. 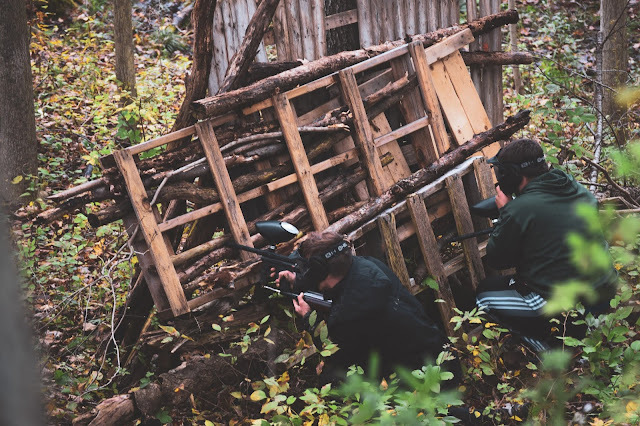 The team with the walkie talkie was able to communicate with Scott and ask him to shoot guys on the opposing team or provide cover fire as they advanced. The opposing team was not allowed to shoot Scott -he was invincible. Scott had the ability to survey and see the whole course from his elevated position and was easily able to take out the enemy. 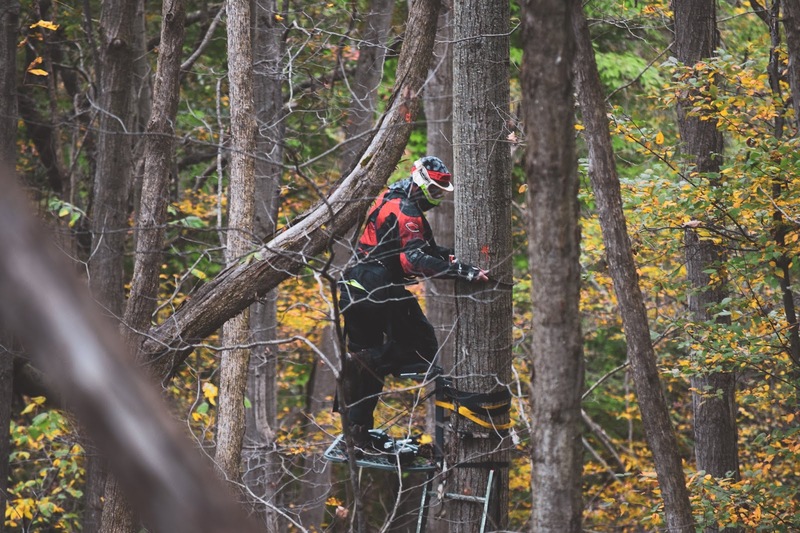 Likened to the way that we as Christians can easily speak to God and ask him for help, the team with the radio was able to take advantage of Scott’s power. It was a pretty powerful object lesson that one of the teams was really able to benefit from. Having Scott up in the tree raining down paintball’s a was clear advantage, and when Lucas Raley's team had the walkie talkie they asked Scott for help and achieved victory without even losing a player. Depending on Scott was a wise move! Another one of the teams however -even though they had the walkie-talkie didn't use it at all! It was crazy! Watching it was painful and almost maddening! They had access to this definitively "game-changing" advantage and they were just scampering through the battlefield un-assisted with the walkie-talkie in their pocket!! It was unbelievable -except that that's pretty much how we live all the time! Josh is a student leader who happened to be on the opposing team and he was also deeply impacted by the situation. The game taught him about having a righteous reverence or fear of God. He said: "It gave me a better idea of what Biblical 'fear of the Lord' is like. I wasn't scared because Scott was mean and unpredictable; I was scared because he was so powerful and could light me up if he wanted to! In the same way, even as God is loving and merciful and just, I should fear Him for how powerful he is." The game provoked Josh to think about what it means to sin against God. Josh said "Sinning is like shooting at Scott -which is clearly a bad idea!" Why do we think it's ok to flippantly and defiantly offend God? She took some time the other night to record things at our weekly large group meeting. This is a fun look at our Friday night gathering. “Hospitalero” is a colloquial term used in Northern Spain to designate those who function as hosts in the “Albergues” or pilgrim hostels along the Camino de Santiago. Cru actually bought an old Farm House in a little farming community called “Ligonde” and we renovated it into a hostel. We would host 10-15 pilgrims each night throughout the summer, providing beds and food to the travelers at no cost. 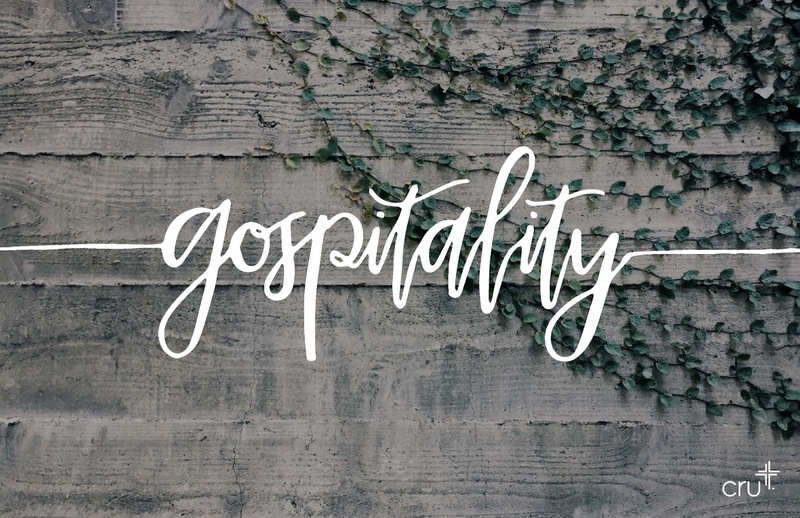 I love the word “hospitalero” because it basically translates to “hospitality guy” (or girl); it’s a meaning packed synonym for “host” I like the word a lot because hospitality is such an important component of Christian ministry. In fact, I think all Christian ministry can ultimately be described as a mission of hospitality. 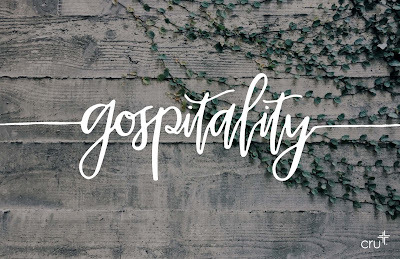 Hospitality means expending yourself -your energy and your resources, in an effort to welcome, accommodate, serve, bless, and provide for others. We see in the root, the word hospital, which of course is a place where doctors and nurses labor to sustain people’s health, and cure them of sickness and disease. To be hospitable means contributing “life” to others! Being hospitable involves creating life-giving spaces and interacting in life-giving ways. It means facilitating rest and recreation for others; traditionally strangers or non-Kin. A hospitable person is one who provides sustenance -food, shelter and even protection for people. When you think of someone who is hospitable you think of someone who is extremely welcoming and inviting. Hospitable people are those who reach out and care for you. Maybe you also think of great parties! Those who are really hospitable can turn even regular everyday activities into a party because they are so loving and warm and full of joy. As part of God’s family, disciples of Jesus Christ are called to join God in his mission of hospitality. We get to steward God’s grace, enabling others to experience his glorious rest. Following after Jesus, we have been commanded to love others, serve and expend ourselves joyfully -even laying down our lives so that others might hear and understand the good news of Christ crucified, buried and risen. Jesus said “Go, and make disciples of all nations” We get to tell people everywhere about God’s amazing grace and the good life found in him. At the beginning of the summer, Lydia, Esther, Mike and I participated in a Tuff Mudder with some other Cru staff and interns. 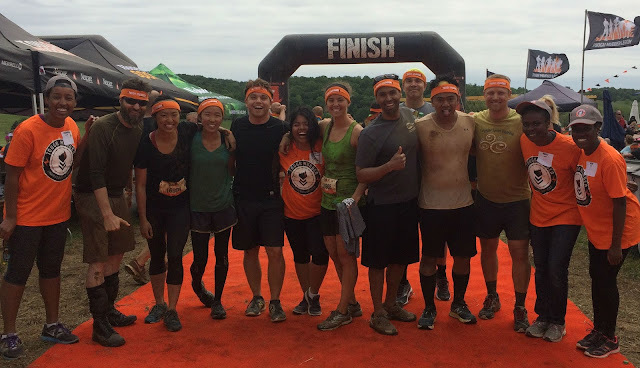 The Tuff Mudder is a great team building exercise and we had a really great team! Cassie and Mercy got to serve as race volunteers. I wanted to share one lesson I took away from my experience. It boils down to this; the stronger you are, the more you can serve. I would love to do the Tuff Mudder again, and If I do, I want to train more and ensure that I get a lot stronger before the race. But not so much for myself actually; I am proof that a minimal amount of training and preparation is enough to enable a person to make it through. I did it. But being stronger would have enabled me to better serve my team as well as lots of other people on the course. What I love about the Tuff Mudder is the way that it facilitates and encourages cooperation and togetherness. You really can't do the Mudder course all by yourself and you aren't supposed to! It's set up to be an adventure endured in community. (That's Biblical!!) Being really strong doesn't benefit you as much as it benefits everybody else! The stronger and more prepared you are, the more people you can help. You can stand there and help more people surmount the obstacles, you can push more people up the walls, you can pull more people across the berms of mud. Being in super good shape doesn't mean you're just gonna go faster and get a better time, because that's not what the Mudder is all about. It's about teamwork and helping others. And the stronger you are, the more people you can help. I've been thinking about how to apply this spiritually. It can be easy so often to be pretty "minimal" and "rushed" in our walk with God. And because it's all about his grace, we will make it to the finish line. But doing it like that means we are missing out on opportunities to serve others like we could be. I want to encourage you to run hard after God and allow him to grow you and develop you and build you up strong. Dig into God's Word, let his promises sink deep into your heart and fight hard to live by faith. Train hard and strive to run the race of life "strong in the Lord and in his mighty power" (Eph 6:10) so that you can help more people to experience the glory of the gospel. We are on staff with Campus Crusade for Christ. We have 5 awesome kids. We currently minister in upstate New York working on the college campus' up here to make Jesus known!